A so-called "plague" of grackles outside the Hancock Center H-E-B. She’ll sometimes see those velvet waves of grackles in the parking lot of her regular H-E-B. Why do grackles seem to flock to H-E-B parking lots at dusk? 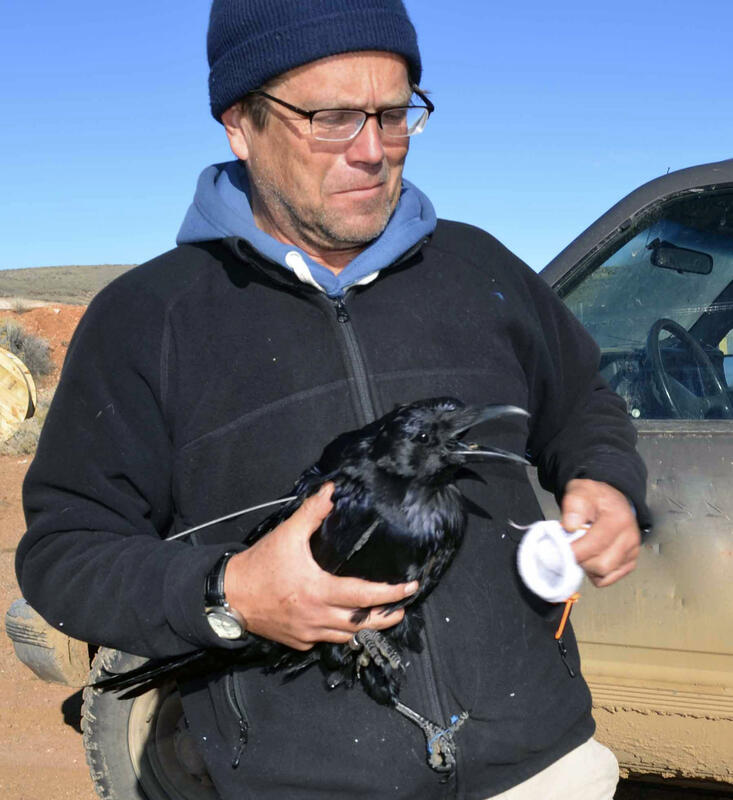 Ornithologist Walter Wehtje banding a raven, not a grackle. That would be a huge grackle. With that, it's time for a lesson in grackles or, as Fort Collins-based ornithologist Walter Wehtje sometimes calls them, Quiscalus mexicanus. Wehtje did his dissertation on the geographic expansion of the three subspecies of great-tailed grackles. He first encountered the birds visiting Texas, and ended up spending years tracking grackle populations in Mexico and the western United States. He says that, in order to answer Pamela’s question, it helps to understand the history of grackles and humans living together. It goes back a long, long way. “It actually predates the Spanish conquest of Mexico,” he says. The Aztecs brought grackles back to their capital after conquering lands along the Gulf Coast. In the 1400s, there was an Aztec Emperor named Ahuitzotl – a relative of Montezuma. 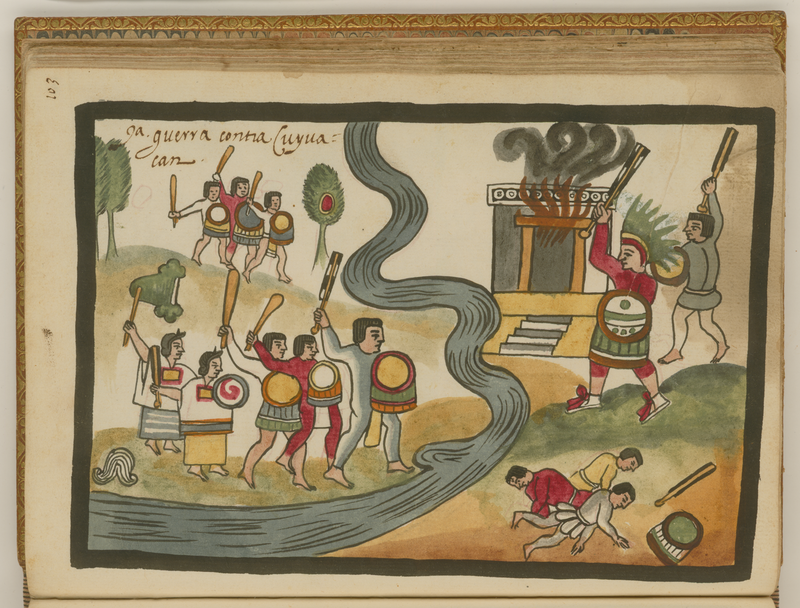 His armies conquered the lowlands to the east of Mexico City, what was then the empire's capital, Tenochtitlan. “On their return, not only did they bring back slaves, but they brought back these large black birds that they were enamored by because they produce these long black iridescent feathers,” says Wehtje. The Aztecs loved using feathers for their clothes and for decorations. “They brought back these grackles and bred them in [what’s now] Mexico City, and after a while, started releasing them, and said that they were not to be harmed.” This may be the first recorded case of humans intentionally relocating wild animals in the New World. It also means that 500 years ago there were already great-tailed grackles flocking to cities. Some of the grackles we see in Texas today could be related to those Aztec birds from hundreds of years ago. Pamela Gooby, pictured here impersonating a grackle, asked the question that sparked our investigation. And, Wehtje says, if you go down to present-day Mexico, you’ll see the exact same pattern. If you go into a Mexican town, usually they have a central square with some shade trees in it. And in the evening, the great-tailed grackles fly into those shade trees to settle down for the night. 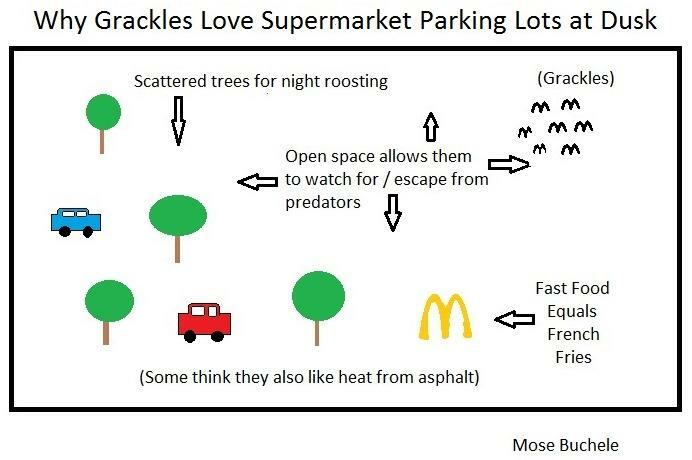 Consider any supermarket parking lot, like the one at H-E-B. If you’re a grackle looking to bed down, this place has everything you want. You have plenty of space. And if you’re a grackle, you love to sleep in large groups. The answer in one simple picture. The shade trees in the parking lot are key, too. They allow you to see predators approaching, and the fact that the trees are scattered gives you an easy way to get out into the open, should you need to escape. And, more often than not, there’s usually a Jack in the Box nearby. “They love French fries,” says Wehtje. Grackles have expanded their range north since the time of the Aztecs. Some have wondered if their recent spread is because of global warming. More likely, Wehtje says, they are following human development. After all, they’ve been learning to live with us since the time of the Aztecs. As Wehtje puts it, "you cant blame them for taking advantage of what we provide, all you can do is say 'wow! these birds really have a good thing going.'" "You should admire them for doing so well in our presence because so many species don't," he adds. That admiration seems to be growing. Grackles are still considered pest birds by many, but in the past several years there seems to be a movement to embrace the birds. Bars are named after them, people proudly sport grackles on their T-Shirts. "Austin is sort of embracing the grackles like they have the bats, says James Brush, the author of "Birds Nobody Loves," a book of poetry about grackles and vultures. "Although I think the grackles have a way to go to catch up with the bats," he adds. What about the woman whose question sparked this investigation? Under questioning, Pamela Gooby initially claimed to be "grackle neutral," but eventually decided she was "grackle positive." She says she likes their song. She likes watching them fly, and she likes the color of their feathers. So what if she needs to wash her car a little more often? 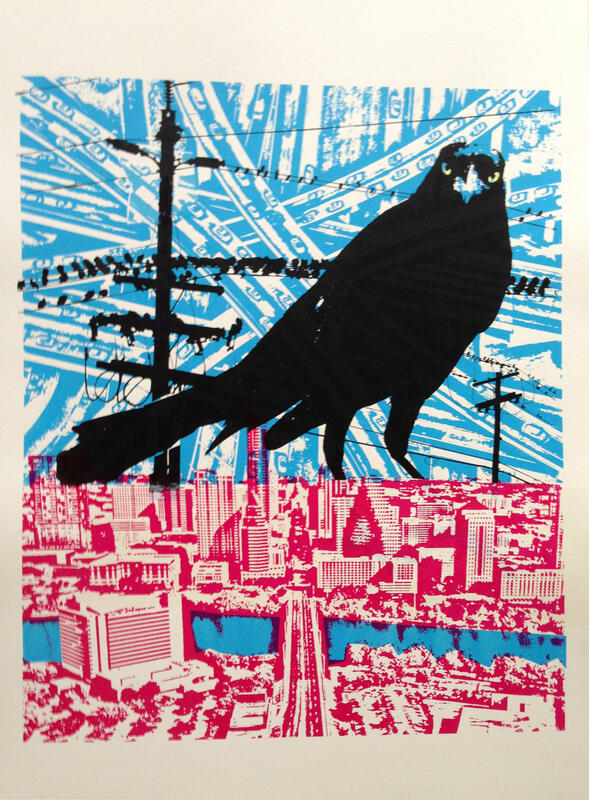 You can find artist Louise Bova's grackle print and other designs here.